This page is dedicated to all the Water Babies, the embryos, the fetuses, that were never brought into this life. This page is for the babies who were here, but for only a little while; long enough to love them completely and to leave a small, broken place where they lived. 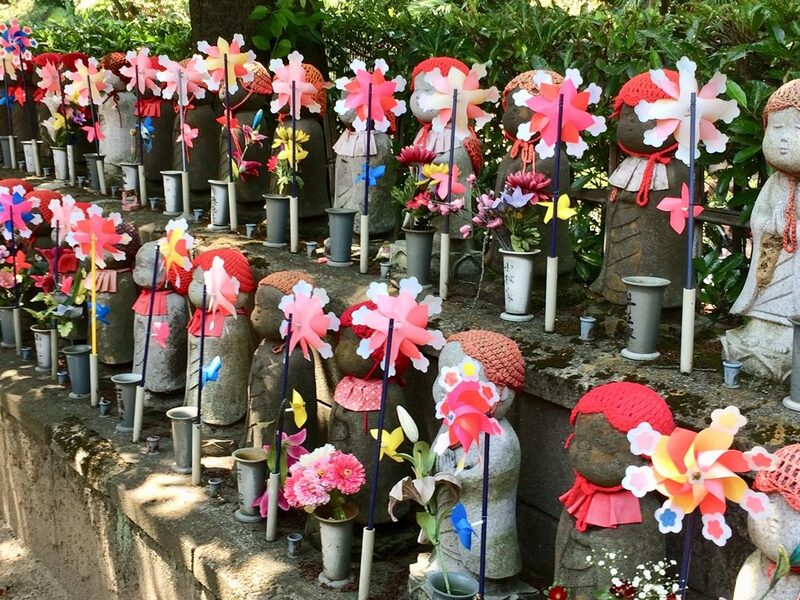 In Japan, Jizo is used in a ceremony to help bereaved parents of “Water Babies” — Mizu (water), ko (child). These are the souls that were never brought into this life or who left before they could live their lives. There are temples all over Japan where ceremonies are held for the parents who could not conceive, who had abortions, miscarriages and whose children did not live long after being born. Jizo is beloved as the protector of all children — and in the hearts of these grieving parents, Jizo brings a special kind of comfort. If you wish to leave a message to your baby on this page, you may feel free to do so. There are guest registries at every temple where parents leave messages for their unborn children. We don’t have this in the West and the lack of a place in which to grieve leaves a hole in our society that cries to be filled. While the emotional issues of loss are very different in each scenario, whether it was a loss by choice, necessity, because of genetic defect, spontaneous miscarriage, stillbirth, crib death… let us honor that grief is grief. No two people can compare their suffering, nor do they need to. We can never know how someone else feels about their loss, however they came by it. We often under-estimate the impact of a loss, especially if and when happy circumstances eventually arrive. Still, I have known so many people who did not have a place to take their grief because they were ashamed of their abortion, their infertility, their guilt at not being grateful for the healthy children they did manage to have in spite of repeated miscarriages or abortions. Grief is grief. Let us allow for all kinds of loss to be valid, equal and deserving of a place to find the safety of the Jizo Bodhisattva and his protection of children. This is my goodbye to my babies who did not become children. I am so sorry, so very sorry that you came too soon for this world. I still miss you, often, and hope you know how much I love you still. I am so happy this page exists because Jizo has become very important to me. In the hours after I learned I would miscarry the tiny baby I already deeply loved, my world was dark and confusing. My husband and I walked along a beach and the thought came to me I need a pebble… but which one do I choose? At that moment, I spied one, sort of standing up in the sand. I held that pebble in the palm of my hand, even as I slept, for the next few weeks, but although I miscarried at home, I would still need a D&C. In the days leading up to the operation that would finally remove the last traces of my pregnancy, I found myself searching for something else to hold onto. I make jewellery so tried searching for a necklace on Etsy. Most of the “miscarriage jewellery” on Etsy is Christian in nature — angels and wings. Although lovely, it wasn’t what I was looking for. I’m not Christian, and nor did I want something that screamed ‘miscarriage’. Most importantly, I wanted a piece of jewellery that would grow with me. And so I kept scrolling. I’m so glad I did, because there, nestled among dozens of silver wings, was a little gold face — one of Valerie’s Jizo pendants. Before I bought myself the pendant, I read some more about Jizo. I am not Buddhist, but here was a light that pierced through the depths of my broken heart. I learned that Jizo, specifically Mizuko Jizo, is the guardian of the unborn, protector of miscarried babies. In a society where my tiny baby was referred to as the heartless “products of conception” I was comforted to learn that there was a place for my baby and my suffering in Japanese culture. The Japanese even have a ritual ceremony — the Mizuko Kuyo — which allows a grieving parent (or, in this case, almost-mama) to take the first step in healing. I bought the tiny gold Jizo pendant because it was about the same size as the baby I lost, whom I would later name Mizuko Bean. I put the pendant on in March 2013 and haven’t taken it off since. I was wearing it when I performed my own version of a Mizuko Kuyo — burying my Bean in the soil of a peace lily, and placing small toys in the earth. An offering to Jizo, and an affirmation to my future child/ren. I was wearing it when I painted my own version of Jizo on my beach pebble. I was wearing it when I learned that I have a genetic disorder and would need a lot of help getting (and staying) pregnant again. I was wearing it when I went through fertility treatments, but this time with my beloved great-grandmother’s engagement ring also suspended on the chain. I am wearing it still, now with my wedding ring threaded on the chain: I am 30 weeks pregnant with a little girl whose every kick reminds me that although the journey before her conception was truly terrible, the greatest heartbreak I have ever known, it was all worthwhile because without any of it, she would not exist. I don’t know when I will stop wearing this pendant. I suspect one day, perhaps many years from now, the chain will break and the little Jizo, his belly button worn from being rubbed between my fingers, will be found by someone else. Or maybe he’ll be returned to stardust, like my Bean, and like my baby girl’s twin brother who vanished. I don’t believe things happen for a reason, but I believe in grasping onto beauty wherever you find it, and holding on for dear life. My little Jizo has taught me that without darkness there is no light. Thank you for this space to acknowledge my babies brief little lives. After 6 years of trying to conceive and 2 attempts at IVF we found we were pregnant with twins. Sadly we lost our first baby at 6 weeks, just days after seeing two hearts beating on ultrasound. And due to complications with the first loss, we lost our second baby Evan at 16 weeks on April 28, 2014, just days after learning his gender. We were able to hold our little Evan, take pictures and have family visit before having to let go and say goodbye. Sadly we never got to have that experience with his twin and even though I grieve for both of my babies, the loss of baby “B” feels different and unresolved. I am so glad that I stumbled upon this website. I will be purchasing your little Jizo pendant in remembrance of both babies but especially for our little baby “B” that we never got to hold. Thank you so much for offering these little Japanese bodhisattva pendants and for a space to acknowledge the grief and loss of our little “water” babies. To Evan and little baby “B”: I love you so much and I am so sorry you left this world before we truly got to know you. You will always hold a very special place in my heart! As I sit and read these beautifully written, heart felt thoughts to all these “water babies’, I remember the day I wrote about my losses and journey to motherhood. It is an odd feeling because, I too, suffered the pain of losing a child and then never becoming pregnant again on my own without the help of extensive fertility treatments. My amazing daughter is here with my husband and I today because of all the pain and loss suffered before she chose us as her parents….It is one of the most bitter sweet things but I would not change a thing… I will forever remember my sweet “water babies” and know that they are with us in the reflection of all that my daughter is and will ever be!!! Two years ago today we found out that I had had a missed miscarriage. Our first and only pregnancy. I decided to name her Elise so that I could rightly mourn her as the baby she was to us. What followed was a roller coaster of emotions and feelings for many many months. I grieved the loss of what might have been. Grief did and still does play a role in my everyday life but I’m happy to say that it does not rule me now as it once did. Her brief existence changed who I am today. She taught me how to be more empathetic, she taught me compassion, she taught me what’s really important in life and that most things that we worry about don’t really matter and are usually beyond our control anyway. She also taught me that out of darkness there is life and that I need to choose happiness. And for this I thank her. I miss her every day but I also know that her light still exists inside of me and it always will. Thank you to Lauren – I stumbled across her blog post about 2 years ago when I was searching for a life preserver in the rough sea of pain and grief. She led me to Valerie and Jizo and Chibi – I am forever grateful. You gave me a safe place to attach my grief to. And a place to help heal. Many many thanks. Susanne, thank you for telling your story here on the wall. I, too, am so glad you found Lauren. …and then us. I will tie Elise’s name on a piece paper to the weeping cypress on my balcony; sending prayers out over the ocean. My darling Quinn, it would’ve been wonderful to see you grow up to be an equally strong and sensitive young man. You left my womb too soon at 16 weeks, and in one week from today you were supposed to enter this world and enter my arms. Instead, I tightly cling to the baby blanket they gave me at the hospital where they had to take you out of me (you wouldn’t leave on your own, you would’ve been such a stubborn little boy! ), and I light candles whenever I need to feel close to you. Being part Japanese, your father and I are going to put together a shrine in the backyard for you, because we want to honor your heritage, while honoring our loss. Love to all who are currently experiencing or have experienced in the past miscarriage, stillbirth, or abortion. This is very hard to write. At this point, we’ve lost you through miscarriage, and you’ve been out of my body since last Thursday when the gestational sac passed, and I’ve been bleeding the last of my uterus lining out even through today. That may continue for another week or so. We had a blighted ovum, which means that you didn’t fully develop even though your fertilized egg attached to my uterus wall. My body somehow identified the egg as not viable, so it didn’t develop into an embryo. This is why we thought that we were 10 weeks along at the time of our first ultrasound, but the doctor thought you were 5.5 weeks. At the first ultrasound, our doctor recommended that we wait two weeks and come in for a follow-up, which is when we found out that you were even smaller than before, and it was not a viable pregnancy. Your Dad and I were destroyed over the news, and we are still grieving for you. We had the option of waiting until my body naturally passed the gestational sac, taking medication [misoprostol] to encourage the passing, or having a D&C. Based on my work schedule for that week, and that Tony was off the entire day we had our appointment, I elected to take the medication that date. I didn’t think I could handle waiting it out, and knowing that you were no longer with us. I did go back to work the next day, but I missed you terribly and I would occasionally have emotional challenges and cry without constraint. I wasn’t crying when I wrote this post, but I am now. You were the light of my life for the few short months you were in me, and I loved you even though you weren’t meant to carry to the full nine-month term. We’ve accepted that this short life was all you were meant to become, and you lived through that cycle. It’s not a tragedy, but rather, a part of paving the way for the child that will be with us outside the womb. It doesn’t mean you are or were any less valuable or special – simply part of the greater plan, which we may not understand yet. You helped me prepare for being a mother, and I won’t ever forget that. Junnie, I am so terribly sorry for you loss. I will send up a Jizo prayer for your lost little one. Junnie, I am so sorry for your loss. There are great parallels to our stories. Your line, “You helped me prepare for being a mother, and I won’t ever forget that.” is so true. Hold onto that. My first language is french so sorry if you don’t get me, it’s been heavy, thank you for giving me a place to lay my sadness. Tu me manques et tu manques terriblement à ta soeur. Je sais qu’on apprendra de ton départ. Je sais que tu es bien là où tu es et j’aime croire que Jizo te protège. Lorsque je m’arrête à penser à toi, mon coeur déborde de tristesse que je n’arrive pas à déposer… à qui parler de ce deuil intangible mais réel. Je me culpabilise à l’idée que tu es peut-être partie parce que je n’étais pas un ” bon nid” (même si au fond de moi je sais que non) ou que tu as cru que je ne pourrais pas m’occuper de toi (ici je suis moins certaine). Je veux te dire que ton passage dans ma vie m’a transformée, qu’il ne sera pas oubliée. Que ta présence me rassure et m’enveloppe souvent. Que je t’aime et t’aimerai. J’aimerais tant arriver à sentir que malgré ton absence notre lien m’habite et m’empli, à sentir le plein plutôt que le vide. J’y travaille. Où que tu sois et peu importe la forme que tu as, sache que tu as été aimée, que tu es toujours aimée, et le sera toujours. Je t’imagine et je t’aime. I am so sorry to you my tiny baby because I wasn’t able to have you- I was too frightened for my own health. I was selfish and I am so sorry. I feel huge waves of overwhelming sadness take over me but I think sometimes I don’t have the right to grieve. Sometimes I think without you life doesn’t matter as I also know I will never be a mother to you, it’s so sad. I will never forget you, everyday I think of you.